One of the hardest things to stomach in any relationship, is being in love with someone who loves someone or something more than they love you. I remember as a child, when I would hear my mother play a song by, The Soul Children," I'll be the other woman", how that song used to confuse me. But now that I am older I now understand that some women and now in today's time that even some men can be the outside person in a relationship. I know some women may find its strange to see a man writing about being the outside person in the relationship, when in years past only women felt that way. I know that might be puzzling to some of you ladies, but yes even some men can feel like the outside person.Yes men to can become lonely on birthdays or holidays.We could also be used by some gold digging or married woman that only wants our bodies, money or just a little time away from their spouses. It may be hard for some to believe but its true and it has happen to me three times in my lifetime. In my case I have dated a woman who was married in my younger years (which was very stupid) and then later in my older years, I also was involved with someone who had a gambling habit. In both cases it was very lonely. Why you may ask?The woman that I dated in my past, was married.She never had time for me, always made an excuses and was never around on holidays. ( Not that they weren't real excuses, because she was married.) Also another woman from my past, had a gambling habit never had time for me either. She was always on the go, going to one bingo hall after the next or the next open casino. When I would complain, the she would simply say, "Well you met me this way and I am not about to change". What ever the case maybe its can be very lonely being second to last. But the most heartbreaking thing of them all came from my ex-wife. After a Christmas holiday my ex-wife came home and told me that she was in love with another man. I was crushed! But as many of you ladies know sometimes even your best isn't enough to keep the one you love to yourself. Ladies, yes a man can feel like the other person, even if its not another man that his woman is in love with. She could be in love with her job, her habit, her hobby,her addiction, her other man or in today's time her woman(smile) and the same could be said when it comes to a man. If in some part of your life or even now you happen to be the other person, write in, then share your thoughts or opinions on the subject. I realized that if your neglected by someone they have a deep rooted issue that has nothing to do with you. Most people would believe that they are not good enough or something is wrong with them. You can't compete with an addiction or desire that's driving a person. My ex husband's "Other" was drugs and women. At that time I just couldn't understand what I was lacking that would keep him from home. I didn't understand it until after I was divorced, discovered my self worth and took a class on dealing with divorce. So we live, we learn from our mistakes and move on to something better. That's life. Why Are We Killing Each Other? Love Me, Love Me Not? Why Do You Want Play With My Emotions? 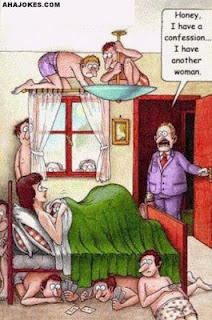 What Would You Do If You Caught Them Cheating? Why Won't My Ex Leave Me Alone? Marriage Or Relationship Are You Scared? How Do You Know When Its Time To Let Go? How Do I Reveal My Secret?